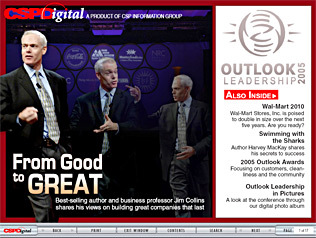 Welcome to CSPDigital's Outlook Leadership 2005 edition, an information-packed online magazine offering you an up-close look at the events, presentations and activities at the 2005 Outlook Leadership Conference, held in Salt Lake City . From Good to Great : Business professor and best-selling author Jim Collins joins a group of the industry's best and brightest, including Sheetz Inc.'s Steve Sheetz , QuikTrip Corp.'s Terry Carter and Wawa Inc.'s There DuPont in discussing what makes good companies great companies. Wal-Mart 2010 : Retail Forward's report on where the retailing giant is headed. Swimming with the Sharks : Business leader and author Harvey MacKay shares his views on surviving in a tough business environment.